(3) The workup of movement disorders. (4) Medications used to treat movement disorders. (5) Botox for movement disorders. Lewy body in a patient with Parkinson's disease. Movement disorders can be daunting to diagnose and even more daunting to treat. They can be classified into bradykinesias (slow movements) and dyskinesias (excess involuntary movements). Careful observation and classification of the abnormal movements is essential to a successful management strategy. There are many different medications that may alleviate these conditions, but much of the real power lies with botox therapy. Bradykinesias are characterized by slowness of movement (Abdo et al, 2010). Parkinson's disease is far and away the most common bradykinetic condition, but there are many others that can mimic it. - Parkinson's disease is characterized by four cardinal symptoms including bradykinesia (slowness in planning, initiating, and executing movements), tremor (usually supination-pronation in a distal upper limb), rigidity (increased muscle tone often associated with pain), and postural instability (a late-stage feature leading to impaired balance and falls) (Jankovic, 2008). Further motor symptoms include freezing (sudden and transient inability to move), dysarthria, dysphagia, and dystonia. There are also non-motor symptoms including cognitive impairment, depression, psychosis, pain, paresthesias, dysautonomia, and sleep disorders (Jankovic, 2008). - It is common, affecting 1% of people aged 65-85 years of age and 4% of people over 85 years of age (Abdo et al, 2010). - It results from death of the dopamine-generating neurons of the midbrain substantia nigra. The reason these neurons die is unknown. - These conditions have the classical features of Parkinson's disease plus some additional features. Strikingly, they do not have the resting tremor, respond poorly to dopamine, and progress more quickly than Parkinson's disease (Mitra et al, 2003). - They are all rare, but progressive supranuclear palsy (PSP) is the most common followed by multiple system atrophy (MSA) and then corticobasal degeneration (CBD). - They all involve the degeneration of various structures and diagnosis is clinical. - There are many medications and conditions that can produce parkinsonism or the appearance of it (Barton et al, 2009). The most common medications are antipsychotics (haloperidol and risperidone) and dopamine antagonists (metoclopramide, promethazine, and prochlorperazine). The most common conditions are depression, normal pressure hydrocephalus, and multiple lacunar strokes (less commonly, hypothyroidism, hyperparathyroidism, hepatic or renal failure, and HIV). - Stiff person syndrome is an autoimmune disorder characterized by progressive muscle rigidity and gait impairment with superimposed painful spasms (Rakocevic and Floeter, 2012). - It is generally idiopathic and results from intrathecal B cell-mediated synthesis of autoantibodies against various proteins in brain and spinal cord inhibitory neurons. However, it can also be paraneoplastic. - Usually starts in the thirties. Starts with hyperlordosis of the spine and a stiff, robotic gait. Major fluctuations in stiffness and spasms occur over the course of a week or even a day. As the condition progresses, most patients develop and increasing frequency of falls and lose their ability to work (Rakocevic and Floeter, 2012). - Diagnosis is a combination of clinical findings, EMG showing involuntary firing of motor neurons resembling a normal voluntary contraction, and anti-GAD antibodies (anti-ampiphysin antibodies in the paraneoplastic variant). Dyskinesias are characterized by excess involuntary movement. They can be broken down into dyskinesias with and without "jerks" (Abdo et al, 2010). - Dytonia can be classified into focal, segmental (two or more adjacent regions), multifocal (two or more nonadjacent regions), hemi (one half of the body) and generalized dystonias (Geyer and Bressman, 2006). - For the focal dystonias, diagnosis is clinical (Phukan et al, 2011). - Tremor is common, with essential tremor seen in 4% of people over 40 years of age (Abdo et al, 2010). - Restless limb syndrome is an irresistible urge to move part of one's body to stop uncomfortable or odd sensations that improves with activity, worsens with rest, and worsens at night. The sensations can be painful, ticklish, itchy, or crawling. It usually affects the legs, but can affect any limb. - There are two etiologies. Primary restless limb syndrome is idiopathic. Secondary restless limb syndrome is associated with a number of medications and conditions but iron deficiency is the most common and accounts for 20% of all restless limb syndrome cases. - Wilson's disease is a disorder in which copper accumulates in the brain and liver. - Affects patients under 40 years of age, although up to 70 years of age has been reported (Roberts et al, 2008). - Neurological symptoms include parkinsonism, akinetic rigidity, ataxia, dysarthria, dystonia, dementia, and a "wing-beating" tremor (Lorincz, 2010). - Diagnosis is clinical combined with a low ceruloplasmin, high 24 hour urine copper, and Kayser-Fleisher rings on slit-lamp examination. - Huntington's disease is a neurodegenerative condition of the striatum. - Presents most commonly with chorea, but also dystonia, bradykinesia, executive impairment, and memory loss (Walker, 2007). - Diagnosis is clinical combined with CAG repeat genetic testing (Walker, 2007). Check medications (antipsychotics, antiemetics, or prokinetics), depression screen, and CT head. Serum ceruloplasmin if the patient is under 40 years of age (if low, 24 hour urine copper and slit-lamp exam). Consider TSH, PTH, Cr, LFTs, and HIV. If no response to levodopa, MRI brain. If the patient is under 26 years of age, order DYT1 gene test. If it is negative try a trial of levodopa. If the above fails or the patient is over 26 years of age, order MRI brain and serum ceruloplasmin (if low, 24 hour urine copper and slit-lamp exam). Electrolytes, Cr, LFTs, and TSH. Many movement disorders can be treated - at least temporarily - with medications. - The initial focus is on treating motor symptoms. - Try nonpharmacological methods first - coffee, walking, dancing, tai-chi, resistance exercise, mindfulness meditation, and LSVT LOUD therapy all have randomized controlled evidence behind them. - Delay medications as long as possible (though some believe early treatment is better than delayed treatment) (Hauser et al, 2008). - A MAOB inhibitor is useful early in the disease course. They provide mild benefit and side-effects and may improve long-term quality of life by 20-25% (Caslake et al, 2009). - The dopamine agonists provide moderate benefit but increase adverse events such as impulse control disorders by 15% (Antonini and Cilia, 2009). - The gold standard is levodopa with carbidopa (the latter prevents levodopa breakdown in the circulation). The lowest dose possible should be used to prevent fluctuations and dyskinesias (Olanow et al, 2013). These should be taken on an empty stomach before meals. - Watch for motor complications. - Treat fluctuations by (1) increasing or dividing the levodopa dose, (2) adding a MAOB inhibitor, (3) adding a COMT inhibitor, (4) trying subcutaneous apomorphine, (5) trying duodenel levodopa, or (6) trying deep brain stimulation. - Treat dyskinesias by (1) decreasing or dividing the levodopa dose, (2) adding controlled-release levodopa at night for nocturnal dyskinesias, (3) adding amantadine, (4) trying subcutaneous apomorphine, (5) trying duodenel levodopa, or (6) trying deep brain stimulation. - Do not neglect nonmotor symptoms. - For depression, try lifestyle therapies (mindfulness, exercise, positive social interaction), psychological therapies (interpersonal, cognitive, and behavioural therapies), and antidepressants (in the order of nortriptyline 10-50 mg nocte, amitriptyline 10-50 mg nocte, citalopram 20-40 mg daily, and escitalopram 10-20 mg daily). - For anxiety, treat the fluctuations first and if that fails, try SSRIs (citalopram 20-40 mg daily, escitalopram 10-20 mg daily). - For apathy, increase the antiparkinsonian medication or try antidepressants. - For orthostatic hypotension, try an abdominal band, night time head-up tilt, increasing water and salt intake, and then fludrocortisone 0.05-0.2 mg daily, and midodrine 10 mg tds as a last resort. - For sialorrhea, benztropine and glycopyrrolate used to be used a lot but now botox into the parotid gland is superior. - For executive dysfunction, try a MAOB inhibitor first, then the rivastigmine patch 1.5 mg bd (increasing by the starting dose every four weeks to a maximum of 6 mg bd) or donepezil 5-10 mg nocte. - For dementia, try the rivastigmine patch or donepezil. - For REM sleep disorder, make the sleep environment safer, first-line is clonazepam 0.25-1 mg nocte (increase and decrease very slowly) second-line is melatonin 3-10 mg nocte, and zopiclone and gabapentin have some evidence behind them. - Watch for nonmotor complications. - Treat nausea by titrating medications up slowly, taking them with meals, or adding domperidone 10-30 mg daily. ​- Treat psychosis by excluding infections and other conditions, removing antiparkinsonian medications one at a time, then if necessary add clozapine 12.5 mg bd up to 150 mg bd over two weeks or quetiapine 50 mg bd up to 200 mg bd over several days. - Treat impulse control disorders by reducing or stopping the dopamine agonist; can also try amantadine, zonisamide, or valproate. - Treat dopamine dysregulation syndrome by gradually reducing the dopaminergic medications, stopping all "booster" doses; can also try valproate. - Treat punding by reducing or stopping the dopamine agonist; can also try amantadine or quetiapine. - Usually, a trial of high-dose levodopa up to 1000 mg daily is attempted. If unresponsive, an MRI brain should be done. - Consider low-dose amitriptyline 10 mg nocte up to 50 mg nocte to improve speech, gait, and mood (but be wary of falls risk). - Hallucinations can be managed with quetiapine 50 mg bd up to 200 mg bd over four days (maximum dose is 400 mg bd). - Initial treatment involves baclofen 5 mg tds (up to 25 mg tds) or clonazepam 1 mg daily (up to 8 mg tds). - If this fails, initiate intravenous immunoglobulin (IVIg) 2 g/kg over five days and continue maintenance infusions of 1 g/kg once a month. Alternatively, use plasma exchange (PLEX). - For focal dystonias, use botox. - For generalized dystonias, try baclofen 5 mg tds (up to 25 mg tds) or clonazepam 1 mg daily (up to 8 mg tds). - Essential tremor can be treated with several different medications (Gironell and Kulisevsky, 2009). - Primidone can go up to 500 mg tds, but only if absolutely needed. - In the case of orthostatic tremor, the medications of choice include clonazepam 1 mg daily (up to 8 mg tds), gabapentin 300 mg nocte (up to 900 mg tds), and levodopa up to 800 mg daily (Gerschlager and Brown, 2011). - First, treat iron deficiency with oral supplementation if present. - The best medication is pregabalin 75 mg nocte (up to 150 mg bd) or gabapentin 300 mg nocte (up to 600 mg tds); if these fail, try pramipexole 125 mg nocte (up to 500 mg nocte) can be used but beware impulse control disorders and augmentation (Garcia-Borrequero et al, 2013). - Always ask the patient to close their eyes and let their head do what it wants, ask about painful sites, and watch them walk to see if the dystonia improves. - In torticollis, inject contrlateral SCM, ipsilateral splenius capitis, ipsilateral levator scapulae, and contralateral trapezius. - In laterocollis, inject all five muscles ipsilaterally. - In shoulder elevation, inject ipsilateral levator scapulae and trapezius. - In anterocollis, inject bilateral SCM and scalenes. - In retrocollis, inject splenius capitis, levator scapulae, and trapezius. - When injecting levator scapulae in the neck always inject posteriorly to avoid damaging the brachial plexus. Hold a wipe or cotton ball with the non-injecting hand. The total dose depends upon dystonia severity (mild, 100-150; moderate, 150-250; severe, 250-500 units botox). - In blepharospasm and eyelid apraxia in patients with PSP, inject orbicularis oculi +/- the pretarsals. - In hemifacial spasm, the strategy depends upon the session timing. If this is the first session, inject orbicularis oculi +/- the pretarsals relying on the trickle effect. 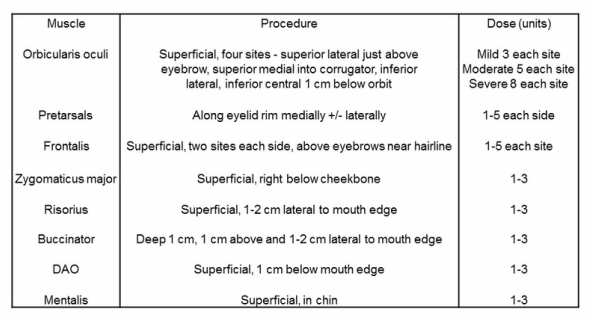 If needed on subsequent sessions, inject orbicularis oculi +/- the pretarsals +/- any of the other facial muscles depending upon those most severely affected. Watch for the facial artery - with zygomaticus major (go high), risorius (not too lateral), and buccinator (not too lateral). - For parotid glands, find the line between the tragus and angle of the mouth, find third nearest the tragus, and inject 2 injections 1 cm above and 2 injections 1 cm below the line. You can also inject under the jaw; aim straight up. -Useful doses for arm muscles are as follows. - For biceps brachii, inject 100-200 units over four sites. - For FDP, insert the needle 5 cm distal to the olecranon, 1 cm medial to the ulna. The muscle is deep. Inject 30-50 units in one site. - For FDS, insert the needle 7 cm distal to the biceps tendon. The muscle us superficial. Inject 30-50 units in one site. - For FCR and FCU, inject 15-50 units in one site. ​- For FPL, inject 10-20 units in one site. Here is a synopsis of Parkinson's disease treatment. Nonpharmacological therapies (coffee, walking, dancing, tai chi, resistance exercise, mindfulness, and LSVT LOUD). Treat motor symptoms (MAOB inhibitors, dopamine agonists, and levodopa). Watch for and teat nonmotor symptoms. Protect the bones (bone density scan, calcium, vitamin D 2,000 u daily, and zolendronate infusion once a year). In movement disorders, the relatively new kid on the block is botox therapy for focal dysotonia and spasm. Botox not only provides symptomatic relief from focal dystonias and spasms, it probably also modifies the natural history of these conditions (Ramirez-Castaneda and Jankovic, 2013). For example, botox therapy has been shown to lower the risk of contractures in cervical dysytonia (Jankovic, 2004). One fairly large retrospective analysis of 235 patients with cervical dystonia, blepharospasm, and hemifacial spasm revealed a two to five year continued improvement of 50% or more from baseline in 68% of the cervical dystonias, 92% of the blepharospasms, and an impressive 96% of the hemifacial spasms (Hsiung et al, 2002). There are many other studies reporting similar benefits (Ramirez-Castaneda and Jankovic, 2013). Abdo et al. 2010. The clinical approach to movement disorders. Nature Reviews Neurology 6, 29-37. Antonini and Cilia. 2009. Behavioural adverse effects of dopaminergic treatments in Parkinson's disease: incidence, neurobiological bias, management and prevention. Drug Safety 32(6), 475-488. Barton et al. 2009. Movement disorders caused by medical disease. Seminars in Neurology 29(2), 97-110. Caslake et al. 2009. Monoamine oxidase B inhibitors versus other dopaminergic agonists in early Parkinson's disease. Cochrane Database of Systematic Reviews 4, CD006661. Garcia-Borrequero et al. 2013. The long-term treatment of restless legs syndrome/Willis-Ekbom disease: evidence-based guidelines and clinical consensus best practice guidance : a report from the International Restless Legs Syndrome Study Group. Sleep Medicine 14(7), 675-684. Gerschlager and Brown. 2011. Orthostatic tremor - a review. Handbook of Clinical Neurology 100, 457-462. Gironell and Kulisevsky. 2009. Diagnosis and management of essential tremor and dystonic tremor. Therapeutic Advances in Neurological Disorders 2(4), 215-222. Hauser et al. 2008. Long-term outcome of early versus delayed rasagiline treatment in early Parkinson's disease. Movement Disorders 24, 562-571. Hausermann et al. 2004. Long-term follow-up of cervical dystonia patients treated with botulinum toxin A. Movement Disorders 19, 303-308. Hsiung et al. 2002. Long-term efficacy of botulinum toxin A in treatment of various movement disorders over a 10-year period. Movement Disorders 17, 1288-1293. Jankovic. 2004. Botulinum toxin in clinical practice. Journal of Neurology, Neurosurgery, and Psychiatry 75, 951-957. Jankovic. 2008. Parkinson's disease: clinical features and diagnosis. Journal of Neurology, Neurosurgery, and Psychiatry 79, 368-376. Lorincz. 2010. Neurologic Wilson's disease. Annals of the New York Academy of Sciences 1184, 173-187. Mejia et al. 2005. Long-term botulinum toxin efficacy, safety, and immunogenicity. Movement Disorders 20, 592-597. Mitra et al. 2003. 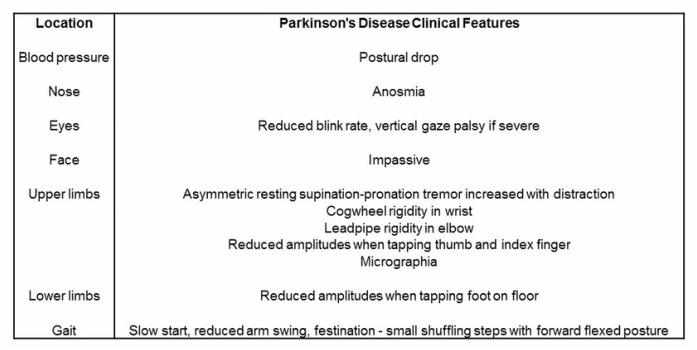 Parkinsonism plus syndrome - a review. Neurology India 51(2), 183-188. Olanow et al. 2013. Factors predictive of the development of levodopa-induced dyskinesia and wearing-off in Parkinson's disease. Movement Disorders 28(8), 1064-1071. Phukan et al. 2011. Primary dystonia and dystonia-plus syndromes: clinical characteristics, diagnosis, and pathogenesis. The Lancet Neurology 10(12), 1074-1085. Rakocevic and Floeter. 2012. Autoimmune stiff person syndrome and related myelopathies:understanding of electrophysiological and immunological processes. Muscle and Nerve 45(5), 623-634. Ramirez-Castaneda and Jankovic. 2013. Long-term efficacy and safety of botulinum toxin injections in dystonia. Toxins 5(2), 249-266. Roberts et al. 2008. American association for study of liver diseases (AASLD). Diagnosis and treatment of Wilson disease: an updaet. Hepatology 47(6), 2089-2111. Walker. 2007. Huntington's disease. The Lancet 369(9557), 218-228.